SAVANNAH, Ga. – World Trade Center Savannah (WTCSav) and National Office Systems are pleased to announce that we have selected Nipuna Ambanpola and Kynder Ganoe, the team representing IVolunteer International as our nomination for the Peace Through Trade Competition, a global student contest hosted by the World Trade Centers Association Foundation (WTCAF). Teams were asked to present an original project, product or other innovative idea that exemplifies and promotes social innovation and sustainability through collaboration, fair trade and ethical international business practices. 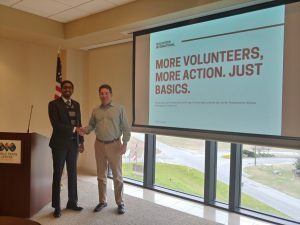 IVolunteer International created a mobile app will reshape how volunteers are connected to volunteer opportunities in their local communities and around the world. IVolunteer International is a non-profit organization with the vision of creating a volunteer in every human being around the world. IVolunteer International (www.ivint.org) connects individuals to volunteer projects globally. Founded in January 2015, their goal is to disrupt the traditional binding memberships, commitments, and immobility of resources. In mid-2019, IVolunteer International plans to launch the revolutionary mobile app to reshape how volunteers connect to projects within their communities and across the globe – making it the first worldwide volunteer app. The goal is to make volunteering easy, accessible, fun and cost-effective. The mobile app, when launched, will identify the user’s location and connect them to volunteer opportunities around them. The users will be able to track their individual volunteer hours and share common-interest opportunities with their friends and family and even celebrate volunteerism! Since 2015, IVolunteer has connected over 2,000 volunteers for more than 40 projects. The team representing IVolunteer will move to the next round which includes an interview with the international board of directors alongside projects submitted from all over the world. The global winner will receive an all-expenses paid trip to the upcoming World Trade Centers Association General Assembly in Querétaro, Mexico in April 2019 to present their project and receive their award on the global stage.